(Moscow, Russia – August 27, 2012) Starwood Hotels & Resorts Worldwide announced plans to expand its portfolio throughout Russia and the Commonwealth of Independent States (CIS). Over the next three years, Starwood will more than double its portfolio in the region with seven new hotels, including the debut of the Aloft brand in Russia with the new Aloft St. Petersburg, a deal that was announced today. Emphasising the importance of the region as one of the world’s fastest-growing hotel and travel markets, CEO Frits van Paasschen and members of Starwood’s senior executive team visited Russia this week, travelling to key growth markets, including Moscow, St. Petersburg, Sochi and Rostov-on-Don. Last year, Starwood opened three new hotels in Russia and CIS, marking a number of key milestones, including the highly successful debut of the W brand in Russia with the opening of W St. Petersburg and the entrance of Starwood into Ukraine and Azerbaijan. With more than 70% of the world’s economic growth coming from fast-growing markets over the next few years, Starwood is focused on expansion in developing markets such as Russia as well as key emerging markets including Ukraine and Tajikistan. The debut of Starwood in Kiev with the opening of Sheraton Kiev Olympiysky, Ukraine in 2013. The hotel will be located in central Kiev at Troitskaya Square, just steps away from famous Khreschatik Street and other city landmarks. The entry of Starwood into Tajikistan in 2013 with the opening of a new Sheraton hotel in the country’s capital city of Dushanbe. Starwood’s second Sheraton hotel in Moscow with the opening of Sheraton Moscow Sheremetyevo Airport in 2013. This new 10-storey hotel will be part of the Skypoint Business Park, located 800 metres from the international terminal of Sheremetyevo Airport. The debut of Starwood in three emerging Russian markets with the openings of a Four Points by Sheraton hotel in Kaluga and a Sheraton hotel in Rostov-on-Don in 2014, followed by the opening of Sheraton Perm in 2015. Russia’s first Aloft hotel with the new Aloft St. Petersburg. Scheduled to open in 2015, Aloft St. Petersburg will be part of an emerging business district within close proximity to galleries, restaurants and green spaces, and will offer an entirely new approach to Russia’s mid-market category. While Starwood is committed to the growth of all of its brands throughout Russia and CIS, the company’s most iconic brand – Sheraton Hotels & Resorts – plays a critical role in its development strategy. Underscoring the importance of the region as one of Starwood’s fastest-growing hotel and travel markets, van Paasschen and seven members of Starwood’s senior executive team visited Russia this week. On the trip, Starwood executives met with hotel owners, customers and investors in Moscow, St. Petersburg, Rostov-on-Don and Sochi with the goal to further understand, appreciate and ultimately leverage different cultural perspectives and approaches to business. Starwood currently operates five hotels in Russia and CIS, including: Hotel National, a Luxury Collection Hotel, Sheraton Palace Hotel, both in Moscow, and the recently opened W St. Petersburg in Russia, Sheraton Baku Airport in Azerbaijan and Four Points by Sheraton Zaporozhye, Ukraine. Starwood Hotels & Resorts Worldwide and its destination sensation brand, Aloft Hotels, announced also the signing of Aloft St. Petersburg. Created to shake up the staid and traditional mid-market hotel sector, Aloft is redefining the category by delivering urban-influenced, modern and vibrant design and a social guest experience at an affordable price point. The opening of Aloft St. Petersburg in 2015 will mark the debut of Starwood’s Aloft Hotels brand in Russia. Owned by Remstroyintour LLC and Ludmila Kudryavtseva, Aloft St. Petersburg will be located in an emerging business district within close proximity to galleries, restaurants and green spaces, and will offer an entirely new approach to hospitality in the city of St. Petersburg. This deal was announced earlier today at a press conference in Moscow with Starwood President & CEO Frits van Paasschen and Roeland Vos, President of the company’s Europe, Africa and Middle East (EAME) Division. “I am pleased to partner with Starwood to bring the Aloft brand to Russia. This hotel will start a new page in the history of the Russian hotel industry,” commented owner Ludmila Kudryavtseva. Situated in the northern part of the city overlooking the Neva River, Aloft St. Petersburg will offer atmospheric public spaces where guests can mix and mingle, read the paper, work on laptops, play a game of pool or grab a drink with friends at the re:mixSM lounge and w xyzSM bar. All 200 loft-like guest rooms will feature the brand’s signature high ceilings, oversized windows and an ultra-comfortable platform bed as well as large walk-in showers with complimentary Bliss Spa products. Guests will be able to re-energise in the re:chargeSM fitness centre and grab a bite to eat at re:fuel by AloftSM, a one-stop, 24-hour grab-and-go food and beverage area, offering sweet, savoury and healthy food, snacks and drinks. For work meetings, training courses and presentations, the hotel’s two board rooms will be equipped with the latest generation of audio-visual hardware. Starwood currently operates three hotels in Russia, including Hotel National, a Luxury Collection Hotel and the Sheraton Palace Hotel in Moscow, as well as the recently opened W Hotel in St. Petersburg. Aloft St. Petersburg will be Starwood’s second hotel in the city. Pebblebrook Hotel Trust announced that it has acquired the W Los Angeles – Westwood hotel for $125.0 million. The 258-room, all-suite, luxury, full-service hotel is located in the Westwood neighborhood of Los Angeles, California. The property will continue to be managed by Starwood Hotels and Resorts (“Starwood”). The 258-room W Los Angeles – Westwood hotel is attractively located in the Westwood neighborhood of Los Angeles. This location offers a diversity of demand generators and convenient access to all the tourist attractions, restaurants, nightlife and entertainment industry activity in Hollywood, West Hollywood, Beverly Hills, Century City, Wilshire, Brentwood, Downtown Los Angeles and Santa Monica. Westwood Village is extremely pedestrian-friendly and is the premiere shopping and commercial center of Westwood, offering a wealth of amenities in a charming and unique setting while hosting national chain retailers, specialty stores, fine dining and casual restaurants, a full array of professional and convenience services, fitness centers, museums and vintage movie theaters that host many of Hollywood’s film premieres. Westwood is also in the heart of the Wilshire Corridor, which features ultra-luxury, high-rise condominium buildings, Class A office buildings, smaller boutique buildings, as well as the University of California, Los Angeles (“UCLA”), which is the largest university in the state of California and is home to a student population of nearly 40,000. W Los Angeles – Westwood features 258 luxurious all-suite guest rooms with signature W Beds and state-of-the-art technology and entertainment. The hotel is known as an urban resort and features expansive, superiorly landscaped outdoor areas, as well as WET, a heated modern pool and cabana filled relaxation area, and The Backyard, a stylish, casual poolside bar and restaurant. The hotel offers 3,300 square feet of indoor meeting space and Bliss Spa, an upscale spa that offers massages, body treatments/wraps, manicures/pedicures, facials, waxing and a retail store. The property is also home to SWEAT, a fully equipped, 24-hour fitness center, as well as a 132-space parking garage with valet service and 24-hour room service. In addition to The Backyard, the hotel boasts two other food and beverage venues: NineThirty, a full-service restaurant that serves three meals daily and specializes in merging modern American cuisine with international influences and Whiskey Blue, a high design, music-oriented, art inspired bar. In 2011, W Los Angeles – Westwood operated at 84% occupancy, with an average daily rate (“ADR”) of $258 and room revenue per available room (“RevPAR”) of $216, 16% below the property’s prior RevPAR peak in 2008. During the next 12 months, the Company currently forecasts that the hotel will generate earnings before interest, taxes, depreciation and amortization (“EBITDA”) of $8.3 to $8.8 million and net operating income after capital reserves (“NOI”) of $7.0 to $7.5 million. Pebblebrook Hotel Trust and Starwood are planning a multi-million dollar public space renovation that will re-concept and renovate the NineThirty restaurant, completely renovate the ground floor lobby, lobby bar and public space, and upgrade and refurbish the meeting space, pool area and The Backyard. The hotel will continue to be managed by Starwood, pursuant to a long-term management agreement. Starwood also manages two of the Company’s other hotels: The Westin Gaslamp Quarter hotel in San Diego, California and W Boston in Boston, Massachusetts. 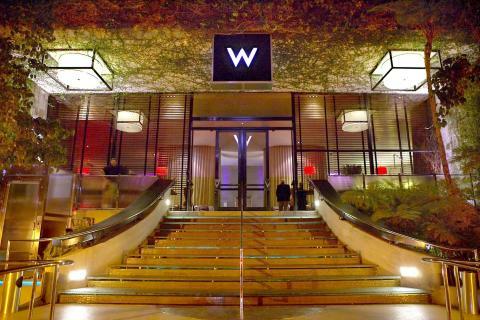 “We’re thrilled to again be partnering with Starwood at W Los Angeles – Westwood. We look forward to future success together as we continue to improve this high-quality hotel,” continued Mr. Bortz. “We have a great working relationship with Pebblebrook Hotel Trust on The Westin Gaslamp Quarter, San Diego, W Boston and Sheraton Delfina Santa Monica, and are pleased to expand our partnership with this iconic property,” said Simon Turner, President of Global Development for Starwood. The Company expects to incur approximately $0.5 million of costs related to the acquisition of the hotel that will be expensed as incurred. The acquisition of W Los Angeles – Westwood brings the total number of properties in the Company’s portfolio to 24, comprising $1.9 billion of invested capital since the Company completed its initial public offering in December 2009. This acquisition marks the Company’s third investment in the Los Angeles market, including the 237-room Mondrian Los Angeles in West Hollywood, California and the 310-room Sheraton Delfina Santa Monica in Santa Monica, California. Aloft Hotels, the “Style at a Steal” brand by Starwood Hotels & Resorts Worldwide announced it has opened its 60th hotel globally with the opening of Aloft Asheville Downtown in Asheville, North Carolina. Owned and operated by McKibbon Hotel Group, Inc., Aloft Asheville Downtown will offer 115 stylish guest rooms and over 1,800 square feet of unique outdoor meeting space on its Air Level pool deck and The Ledge observation deck, as well as 649 square feet of indoor meeting space in an unbeatable downtown location. Aloft Asheville Downtown is walking distance to numerous restaurants, breweries, shops and galleries. Just minutes from the Blue Ridge Parkway and Biltmore House and Gardens, the hotel is within walking distance of Pack Square Park, Diana Wortham Theatre and the renowned Orange Peel music venue. Aloft Asheville Downtown features artwork in public spaces and guest rooms that is produced entirely by local artists, and is the only hotel in downtown with convenient covered parking. Pioneering initiatives in pop culture, design, and technology have positioned Aloft as a must-have brand for the next generation of travelers. Aloft hotels has reported consistently high guest satisfaction scores since launch, reflecting the success of its modern, and vibrant design at an affordable price point. The Aloft social guest experience, with the buzzing re:mix™ lounge and happening w xyz™ bar, has earned select hotels within the portfolio designations on TripAdvisor’s 2011 “Top 10 Trendiest Hotels in the US” and “Top 10 Trendiest Hotels in the World” rankings lists. may be a great author.I will be sure to bookmark your blog and will often come back in the future.